For four decades UC San Diego atmospheric scientist Veerabhadran "Ram" Ramanathan has warned that carbon dioxide and other emissions from human activity are heating up the planet. One of the first scientists to predict global warming, his models of rising temperatures have proved remarkably accurate. Ramanathan prefers the term "climate disruption" to climate change because it more accurately describes the severity of what we are observing. "Drought, heat waves, forest fires — we are already seeing this," he says. But now Ramanathan also has a new, and much less dire, prediction: After decades of inaction on global warming, we finally may be at the tipping point toward real progress ­­— thanks to the growing awareness among religious and political leaders about what's at stake. Veerabhadran 'Ram' Ramanathan meets with Pope Francis to discuss how the Catholic Church can play an active role in the war on climate change. When Ramanathan moved to the United States from India, he was not dreaming of a high-profile career in climate science. He planned on a career in engineering that would afford him his dream: being the proud owner of a shiny new Chevy Impala. In 1975, his discovery of the powerful greenhouse effect of chlorofluorocarbons (CFCs) in the Earth’s atmosphere changed the course of climate science and burst the bubble on his dream. “Now I drive a Smart car,” he says with a grin. When it comes to the current state of climate disruption, Ramanathan cuts to the chase. “Few understand the urgency of the issue. It’s going to get worse, and very soon,” Ramanathan says. “I pray that the skeptics are right, that it’s a hoax that will just go away by itself. But it’s not ... we have empirical evidence for all of the impacts of climate change." Much of Ramanathan’s recent work revolves around what he calls the “two worlds approach” to managing climate change. Looking at the source of climate pollutants, there is a striking disparity: The wealthiest 1 billion people on Earth have seemingly unlimited access to fossil fuels, while the poorest 3 billion people have essentially no access to fossil fuels — yet they will be the ones to disproportionately feel the effects of climate change due to the burning of fossil fuels. After decades of writing what Ramanathan calls various “obituaries” for the planet — he's authored more than 200 papers over the course of his career — the lack of action on the issue around the world started to make him wonder if all his work had been worth it. Then, while on a research trip in the Maldives in 2004, he received an email from the Vatican. Pope Saint John Paul II was inviting him to join the Pontifical Academy of Sciences. It took him a moment to realize that the email was real, not spam. Pope Francis famously said “God is not a magician,” and neither is Francis: His understanding of the issues that face today’s world comes from surrounding himself with top experts. The Pontifical Academy of Sciences was established in 1936 for just this purpose, and is made up of some of the most distinguished scientific minds in the world, of many faiths, cultures and backgrounds. 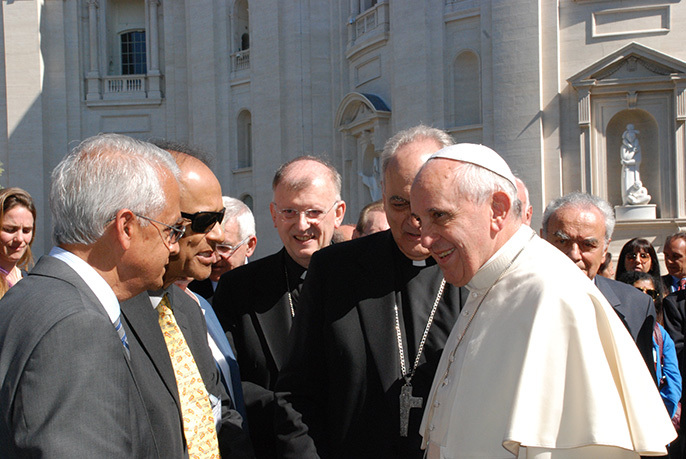 After a workshop on climate change with the Pontifical Academy in 2014, Ramanathan learned that he was to have a short audience with the pope. His chance came in an unexpected venue: a parking lot behind the pope’s residence. With only a few short minutes to make his pitch, he made every word count. “I told him that the poorest 3 billion people are going to suffer the worst consequences of climate change, even though they had very little to do with that pollution," he said. The pope asked what he could do about it, so Ramanathan asked him to please ask people in his speeches to be better stewards of the planet. Pope Francis listened, and did more than just mention climate change in speeches. In June 2015, the Vatican issued an unprecedented 184-page encyclical focused on the environment, with a powerful call to action to the people of the planet to address the impending threat of climate change. The pope is not alone among religious and cultural leaders to push for collaborative action on climate disruption. At the Global Compassion Summit at UC Irvine in 2014, the Dalai Lama said compassion combined with new technologies could make a great difference in slowing climate change while also creating jobs. Ramanathan stresses that the science of climate change has been well understood for a long time — and not just from statistical models, but from empirical data as well. For example, measurements show that sea ice diminished by 40 percent between 1979 and 2012, and the darkening of the Earth’s surface measurably exacerbates the rate of warming. The fact that there has been so little action on climate change points to a serious communication problem, and this is where religious and cultural institutions, like the Catholic Church, and influential lawmakers come in. “An alliance between science, religion and policy could be the tipping point we need toward real action on climate change,” Ramanathan said, and momentum seems to be building. Ramanathan has worked closely with Gov. Jerry Brown, who has ambitious carbon reduction goals for California and in July took part in a meeting at the Vatican called by Pope Francis to spur action among local leaders of the world, including New York City Mayor Bill de Blasio and the mayors of Stockholm, Rio de Janeiro and other world cities. In September, Pope Francis is set to address the UN where he will call for new international commitments to fight climate change and help the poorest countries with climate-related challenges. Brown and others maintain Ramanathan's work has been a catalyst for climate action: “Climate change is one of the greatest existential threats facing humankind and Dr. Ramanathan is not just sounding the alarm, he’s working to find solutions,” Brown said. In October, Ramanathan will chair the UC Summit on Carbon and Climate Stability at UC San Diego, drawing scientists, lawmakers and business leaders, and sponsored by UC President Janet Napolitano’s Carbon Neutrality Initiative. The goal of the summit is to come away with actionable results, taking UC’s carbon neutrality research and California’s climate policies as practical examples to develop scalable solutions for the global problem.